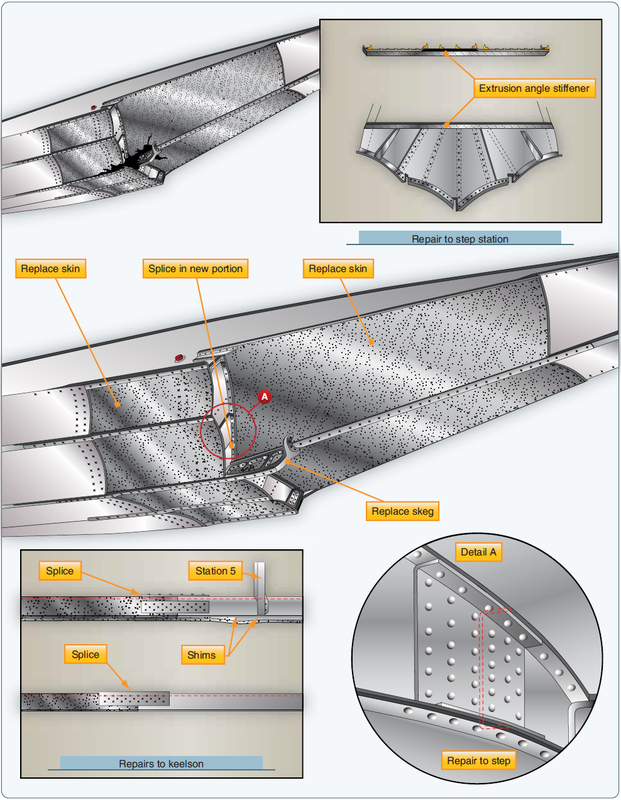 This page describes typical repairs of the major structural parts of an airplane. When repairing a damaged component or part, consult the applicable section of the manufacturer’s SRM for the aircraft. Normally, a similar repair is illustrated, and the types of material, rivets, and rivet spacing and the methods and procedures to be used are listed. Any additional knowledge needed to make a repair is also detailed. If the necessary information is not found in the SRM, attempt to find a similar repair or assembly installed by the manufacturer of the aircraft. To maintain the float in an airworthy condition, periodic and frequent inspections should be made because of the rapidity of corrosion on metal parts, particularly when the aircraft is operated in salt water. Inspection of floats and hulls involves examination for damage due to corrosion, collision with other objects, hard landings, and other conditions that may lead to failure. NOTE: Blind rivets should not be used on floats or amphibian hulls below the water line. Damage to metal aircraft skin that exceeds repairable limits requires replacement of the entire panel. [Figure 3] A panel must also be replaced when there are too many previous repairs in a given section or area. In aircraft construction, a panel is any single sheet of metal covering. A panel section is the part of a panel between adjacent stringers and bulk heads. Where a section of skin is damaged to such an extent that it is impossible to install a standard skin repair, a special type of repair is necessary. The particular type of repair required depends on whether the damage is repairable outside the member, inside the member, or to the edges of the panel. For damage that, after being trimmed, has 81⁄2 rivet diameters or more of material, extend the patch to include the manufacturer’s row of rivets and add an extra row inside the members. For damage that, after being trimmed, has less than 81⁄2 manufacturer’s rivet diameters of material inside the members, use a patch that extends over the members and an extra row of rivets along the outside of the members. 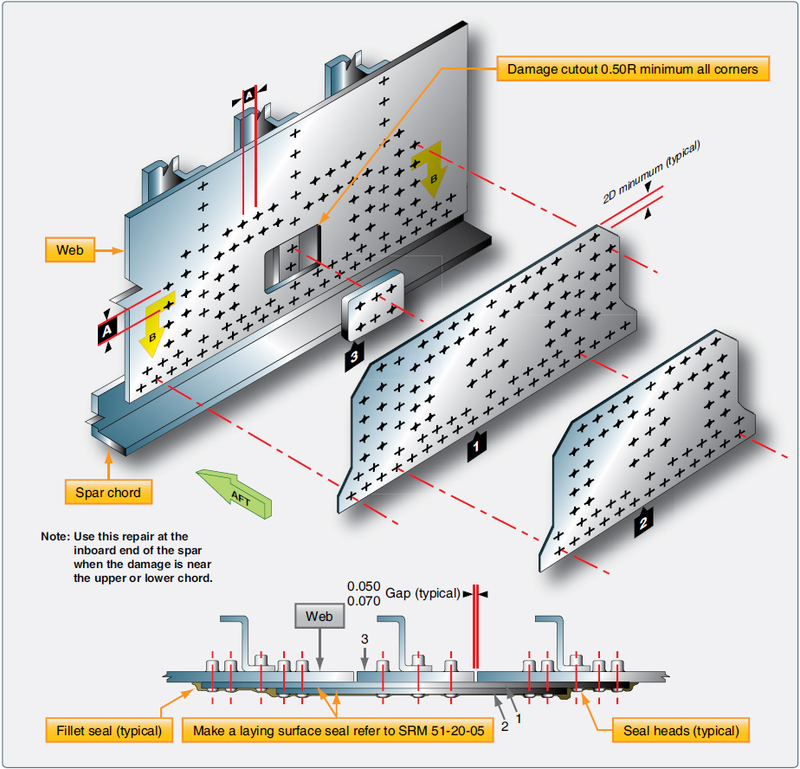 For damage that extends to the edge of a panel, use only one row of rivets along the panel edge, unless the manufacturer used more than one row. The repair procedure for the other edges of the damage follows the previously explained methods. The procedures for making all three types of panel repairs are similar. Trim out the damaged portion to the allowances mentioned in the preceding paragraphs. For relief of stresses at the corners of the trim-out, round them to a minimum radius of ½-inch. 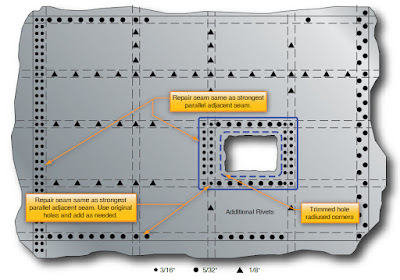 Lay out the new rivet row with a transverse pitch of approximately five rivet diameters and stagger the rivets with those put in by the manufacturer. 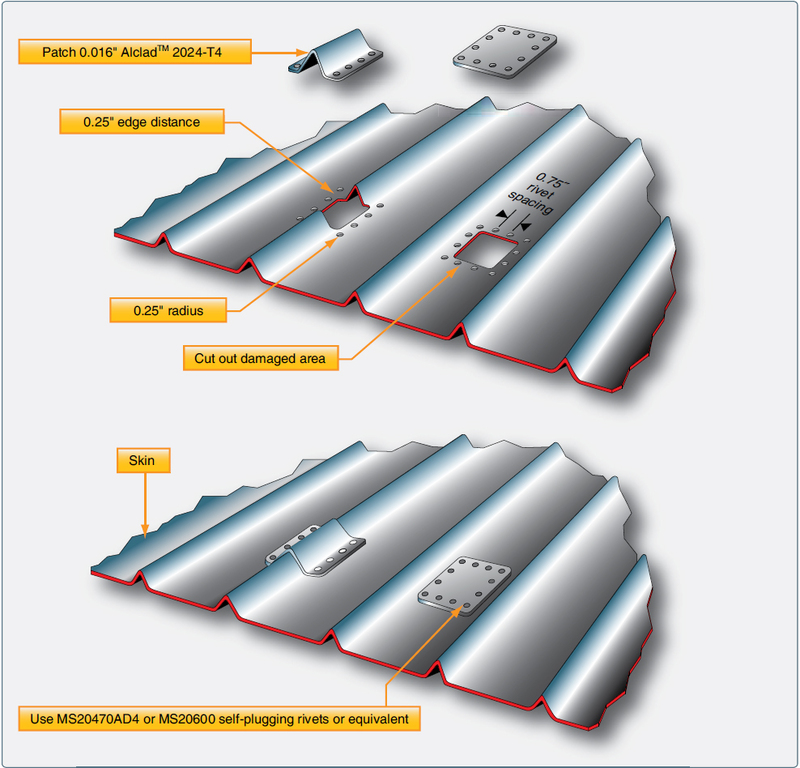 Cut the patch plate from material of the same thickness as the original or the next greater thickness, allowing an edge distance of 21⁄2 rivet diameters. At the corners, strike arcs having the radius equal to the edge distance. Chamfer the edges of the patch plate for a 45° angle and form the plate to fit the contour of the original structure. Turn the edges downward slightly so that the edges fit closely. Place the patch plate in its correct position, drill one rivet hole, and temporarily fasten the plate in place with a fastener. Using a hole finder, locate the position of a second hole, drill it, and insert a second fastener. Then, from the back side and through the original holes, locate and drill the remaining holes. Remove the burrs from the rivet holes and apply corrosion protective material to the contacting surfaces before riveting the patch into place. As discussed earlier, lightening holes are cut in rib sections, fuselage frames, and other structural parts to reduce the weight of the part. The holes are flanged to make the web stiffer. 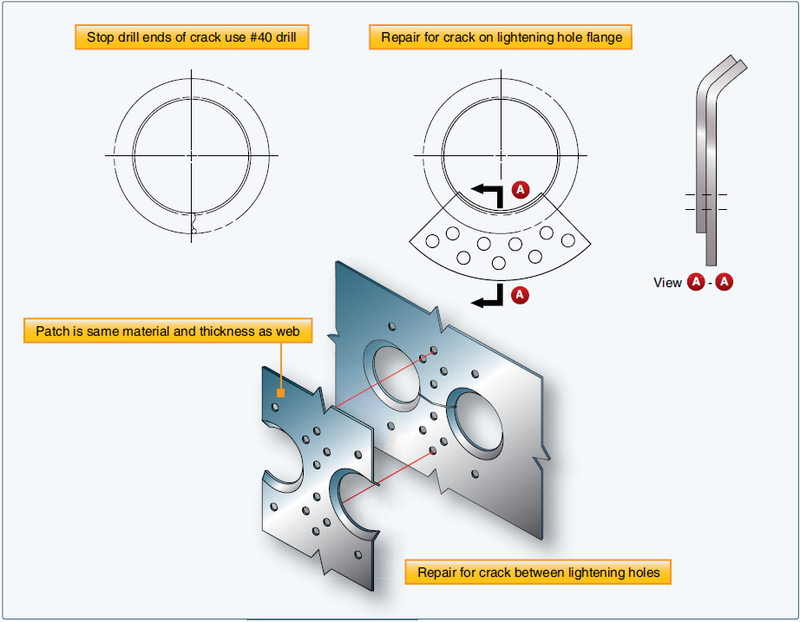 Cracks can develop around flanged lightening holes, and these cracks need to be repaired with a repair plate. The damaged area (crack) needs to be stop drilled or the damage must be removed. The repair plate is made of the same material and thickness as the damaged part. Rivets are the same as in surrounding structure and the minimum edge distance is 2 times the diameter and spacing is between four to six times the diameter. Figure 4 illustrates a typical lightening hole repair. Remove the damaged skin section. Radius all corners to 0.5-inch. Fabricate a doubler of the same type of material as, but of one size greater thickness than, the skin. The size of the doubler depends on the number of rows, edge distance, and rivets spacing. 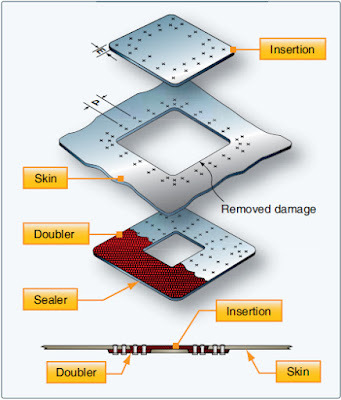 Fabricate an insert of the same material and same thickness as the damaged skin. 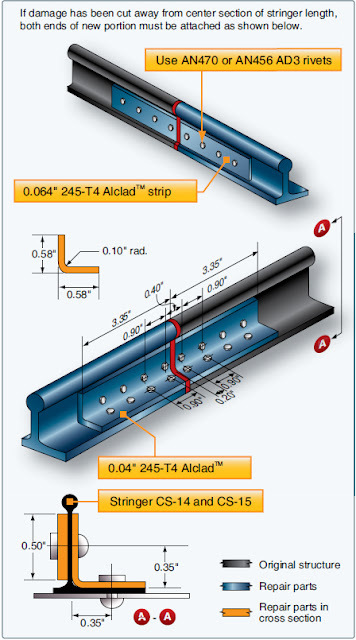 The skin to insert clearance is typically 0.015-inch to 0.035-inch. Drill the holes through the doubler, insertion, and original skin. Spread a thin layer of sealant on the doubler and secure the doubler to the skin with Clecos. Use the same type of fastener as in the surrounding area, and install the doubler to the skin and the insertion to the doubler. Dip all fasteners in the sealant before installation. The fuselage stringers extend from the nose of the aircraft to the tail, and the wing stringers extend from the fuselage to the wing tip. Surface control stringers usually extend the length of the control surface. The skin of the fuselage, wing, or control surface is riveted to stringers. Stringers may be damaged by vibration, corrosion, or collision. Because stringers are made in many different shapes, repair procedures differ. The repair may require the use of preformed or extruded repair material, or it may require material formed by the airframe technician. Some repairs may need both kinds of repair material. When repairing a stringer, first determine the extent of the damage and remove the rivets from the surrounding area. [Figure 6] Then, remove the damaged area by using a hacksaw, keyhole saw, drill, or file. In most cases, a stringer repair requires the use of insert and splice angle. 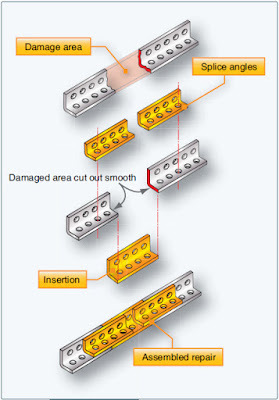 When locating the splice angle on the stringer during repair, be sure to consult the applicable structural repair manual for the repair piece’s position. Some stringers are repaired by placing the splice angle on the inside, whereas others are repaired by placing it on the outside. 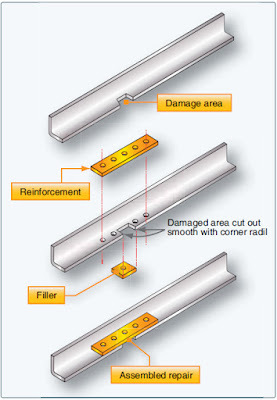 Extrusions and preformed materials are commonly used to repair angles and insertions or fillers. 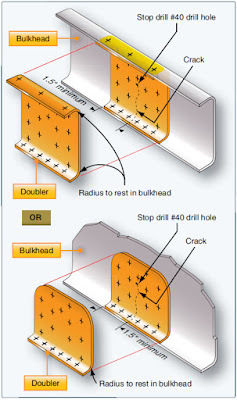 If repair angles and fillers must be formed from flat sheet stock, use the brake. It may be necessary to use bend allowance and sight lines when making the layout and bends for these formed parts. For repairs to curved stringers, make the repair parts so that they fit the original contour. 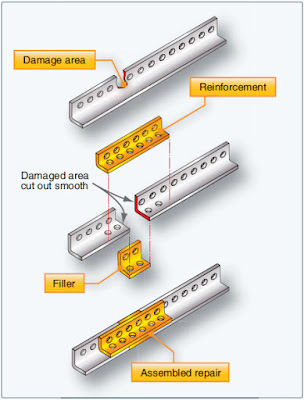 Figure 7 shows a stringer repair by patching. This repair is permissible when the damage does not exceed two-thirds of the width of one leg and is not more than 12-inch long. Damage exceeding these limits can be repaired by one of the following methods. Figure 8 illustrates repair by insertion where damage exceeds two-thirds of the width of one leg and after a portion of the stringer is removed. Figure 9 shows repair by insertion when the damage affects only one stringer and exceeds 12-inch in length. Figure 10 illustrates repair by an insertion when damage affects more than one stringer. Bulkheads are the oval-shaped members of the fuselage that give form to and maintain the shape of the structure. Bulkheads or formers are often called forming rings, body frames, circumferential rings, belt frames, and other similar names. They are designed to carry concentrated stressed loads. There are various types of bulkheads. The most common type is a curved channel formed from sheet stock with stiffeners added. Others have a web made from sheet stock with extruded angles riveted in place as stiffeners and flanges. Most of these members are made from aluminum alloy. Corrosion-resistant steel formers are used in areas that are exposed to high temperatures. Bulkhead damages are classified in the same manner as other damages. Specifications for each type of damage are established by the manufacturer and specific information is given in the maintenance manual or SRM for the aircraft. Bulkheads are identified with station numbers that are very helpful in locating repair information. 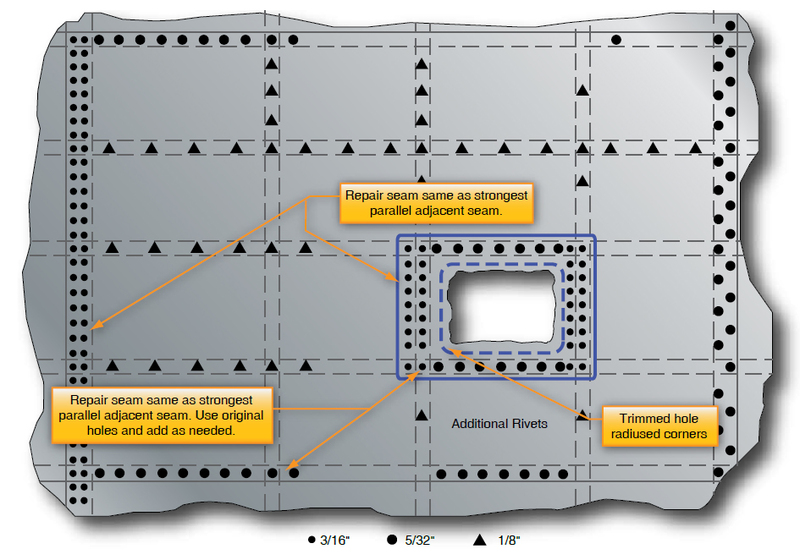 Figure 11 is an example of a typical repair for a former, frame section, or bulkhead repair. Stop drill the crack ends with a No. 40 size drill. Attach the doubler to the part with clamps and drill holes. Most repairs to bulkheads are made from flat sheet stock if spare parts are not available. 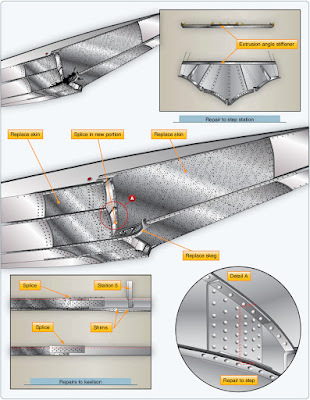 When fabricating the repair from flat sheet, remember the substitute material must provide cross-sectional tensile, compressive, shear, and bearing strength equal to the original material. Never substitute material that is thinner or has a cross-sectional area less than the original material. Curved repair parts made from flat sheet must be in the “0” condition before forming, and then must be heat treated before installation.